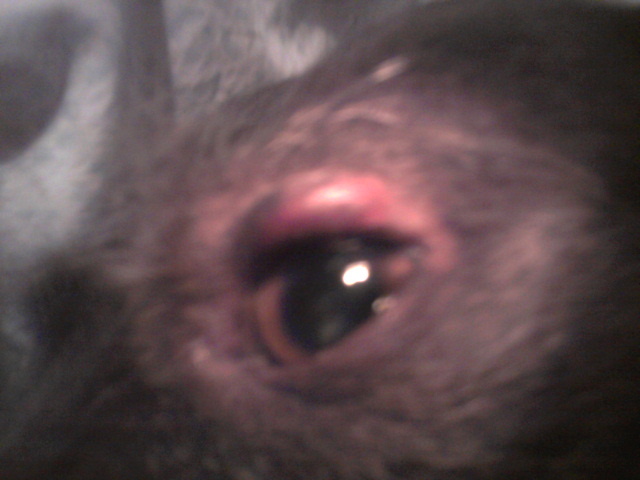 This morning I noticed redness and swelling of my dog's upper eyelid. I gave him one dose of 12.5 mg of Benadryl, (the dosage previously recommended by his vet) but this didn't seem to change anything. He isn't really scratching at the area and it doesn't seem tender to light touch. The eye itself is not draining and seems otherwise normal. There is another dog in the house as well as a kitten and the three play together a lot, so I can't rule out a scratch or other injury, though I don't see an overt cut or scratch. Any advice as to what I should do? With the holiday approaching, I'm worried a wait and see approach might land me in an emergency vet. Sometimes Benadryl may not be strong enough to bring down the swelling in an allergic reaction. But, if it is not bothering Kirk then it may be ok to just watch things for now. If there is still a significant amount of swelling there within 24 hours then I would have the vet take a look. If the white part of the eye looks red and irritated then I would take him in right away. Any sort of scratch could be serious. But, it's not common to have swelling on the eyelid because of a scratch. There are other types of infections or even tumors that can look like this, but they would not come up quickly like this did. I think you will probably find that things resolve within 24 hours, but if they don't then a vet visit is in order.